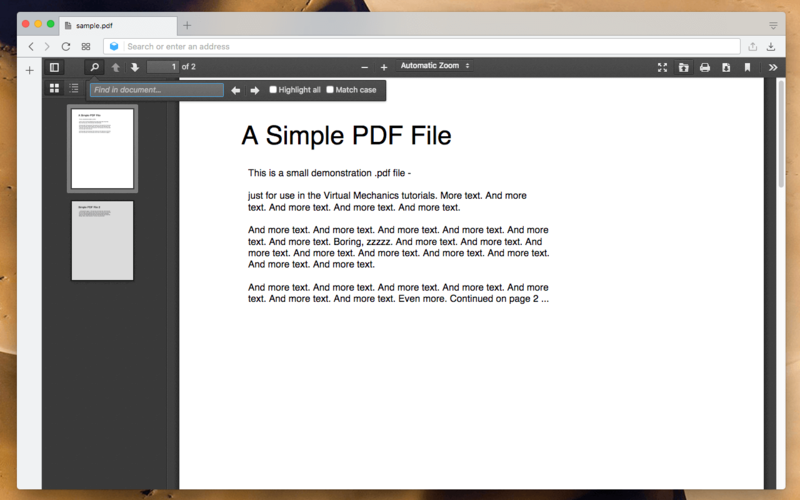 "PDF Reader" extension brings Mozilla's PDF viewer to the Chromium-based browser. The extension uses the powerful PDF.js open-source library to handle pdf fetching, parsing, and rendering. When the extension is installed, all top-level requests of PDF format will be handled by this extension. So the default PDF reader of your browser is being replaced with the rendering engine of this extension. Note that the extension is capable of opening both server- and local-side PDF files. For the local PDF files to be parsed, make sure to enable 'Local File Access' from the extension manager. What is the "PDF Reader" extension and how does it work? This extension is meant to replace the default PDF viewer of your browser with the open-source and fast PDF.js library. The extension offers the exact same experience as you open PDF files in the Mozilla Firefox browser for Chromium-based browsers. In oppose to the default PDF reader of your browser which usually requires full fetch of the PDF document before being able to render it, this extension loads the first few pages of the document as soon as the fetched data is renderable. Note that this extension only passes the URL of the document to the PDF.js library and it does not render the PDF file internally. So you need to report rendering issues to the PDF.js GitHub page. Can I use this extension to open PDF files locally? Yes, the extension is capable of opening both server- and local-side PDF documents. For the local documents, the extension needs to have the permission to access local contents. Open your browser's extension manager (chrome://extensions/) in a browser tab and find this extension. Press the details button and check the "Allow Local Access" option for this extension. Now reload the page with a local PDF URL or drop a new PDF file to your browser. It should get rendered by this extension. Can I print a PDF file using this extension? Yes, on the top-right side there is a button to print PDF files. Can I download a PDF file using this extension? Yes, when the UI is loaded, there is a download button on the top-right side of the UI. Click on the icon to ask the extension to download the PDF file to your default download directory. This extension does not render embedded PDF files in web pages. Is there any reason for that? Usually, embedded PDF files are for a quick review and hence do not need PDF tools like browse and search or index listing. So the extension prevents from rendering them. Basically, your default PDF renderer handles all the sub-frame requests. If you would like this extension to handle these jobs, please add a note to the comments section of this page.